1970 – entered a Music School, where was studied piano, violin, music theory, music history, singing with choir, playing with ensemble and orchestra. 1993 – continued post-graduate finishing the Ph.D.
1996-2006 – Tatiana has been teaching at the Moscow Conservatory’s Academic Music College, Central Moscow Music School and ‘New Names’ Foundation in Moscow. 2001 – She was an Adjudicator for an International Competition in Athens. Several of her students including her son Artem Guivarguizov became Laureates of International Competitions. 2007 – 2013 Assistant of Concertmaster of the Vancouver Symphony Orchestra. 2007- 2016 – participating in Festivals and Chamber programs, plays with Bravo Vancouver, MTDuo, Grazioso Duo, Duo Con Anima, DTQuartet. 2010-2012 – has been teaching at Rose City Music Academy, Portland. 2010 – Tatiana juried the Metropolitan Youth Symphony Competition. 2010 and 2011 – Adjudicator for the VSO Youth Artist Competition. 2011-2019 she has been coaching solo, ensembles, orchestras at Vancouver School of Arts & Academics and Thomas Jefferson Middle School, Covington Middle School, Parkrose High School. Tatiana coached Clark College Orchestra, Union Hight School the violin & viola orchestral sections, Piano Trios, String Quartets. 2016-2017 Tatiana worked as a judge for Solo/ Ensemble Festivals at Cascade & Covington Middle Schools, and in 2019 at the Mozart Club Music Festival/ Beacock music co.
2015-2019 she has coached quartets at Pacific Crest Quartet Camp. Tatiana’s students participate in their schools orchestras, also in Metropolitan Youth Symphony and Portland Youth Philharmonic. 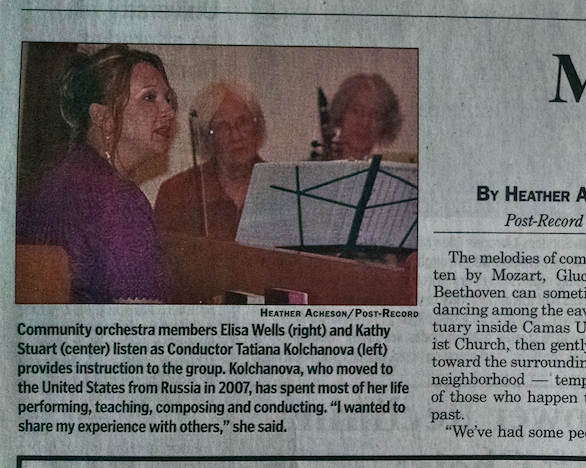 Tatiana is a founder and conductor of Camas-Washougal Community Orchestra. She is member of Music Teachers National Association, Washington State Music Teachers Association and Clark County Music Teachers Association.